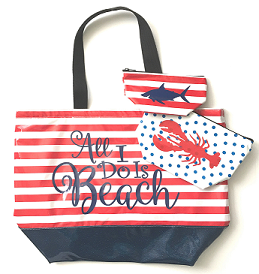 Perfect to carry EVERYTHING to the Beach, Pool, or Sporting Events! Pair it together with a couple of cosmetic bags to keep it organized! This bag features 3 interior pockets with 1.5" wide black webbing handles that are 27" long and a GLITTER VINYL bottom! Personalization is vinyl decal as shown.